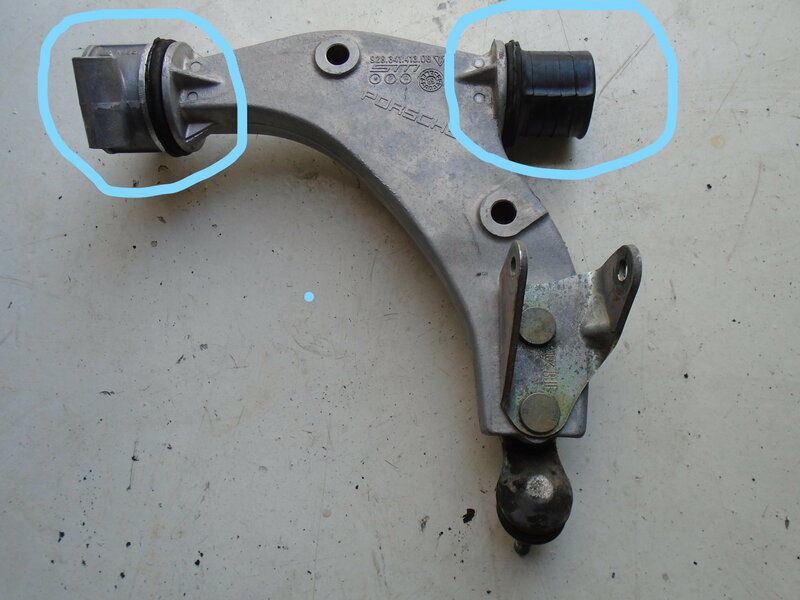 on the lower control arm rubber bushes, or leave them alone and install everything "dry"
Those bushings are molded in place on the arms, and for the front they are molded into the carrier too. There is no rubbing. In the front carrier, if there's rubbing it means that you need to replace the bushings. In the rear, rubbing means your bushing isn't securely clamped, and it's slipping. There are some aftermarket bushings mentioned over the last few years, You get to remove all the old rubber to clean metal, and then get the new bushings bonded in place. Meanwhile, Mark at 928 International has arranged with the original manufacturer to have used pieces rebuilt with all new rubber parts made as they were originally. He offers the arm on an exchange basis. The upper arms are similarly available, and they include new balljoints too, so a plug-and-play installation really. Contact 928 International for details. best 928 injector with Porken chipset and 87 fpr?